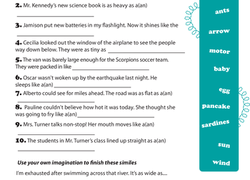 These year six reading comprehension worksheets will help your child rise to the challenge presented by longer, more complex texts they’re sure to encounter this year and beyond. With a wide variety of engaging passages and thought-provoking activities, young readers will take their literary analysis skills to new heights as they dive deeper into text meanings, story mapping, character development, and more. Can You Spot the Main Idea? Help students learn how to identify the main idea and supporting details in a text.